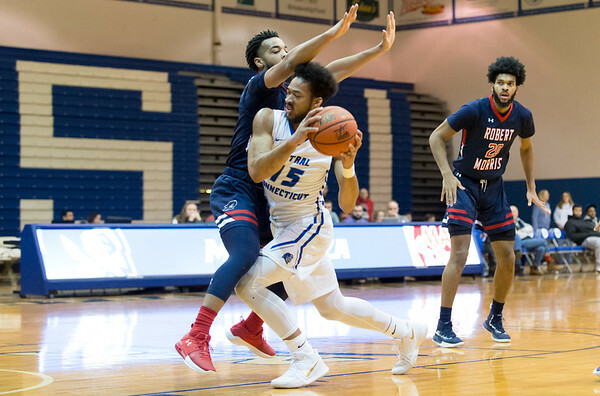 PITTSBURGH- CCSU men’s basketball made a statement with a 77-68 win over conference foe Robert Morris, who entered the game first place in the NEC. With the game tied late in the second half, the Blue Devils rattled off a crucial 8-0 run, while shooting 10-for-13 at the foul line in the game’s closing minutes to seal the victory. Senior Tyler Kohl, coming off another Conference Player of the Week award, dropped 23 points to go along with his seven rebounds in the win. Fellow senior Deion Bute finished with a double-double, scoring 11 points while grabbing 11 rebounds. The Colonials led 10-9 in the first half before the Blue Devils went on an 8-0 run sparked by Kohl, who hit a jumper before freshman Ian Krishnan converted a 4-point play to give CCSU a five point lead. Bute capped off the run with a layup to give the Blue Devils their largest lead of the half. Robert Morris responded with back-to-back three-pointers by Josh Williams, who scored eight straight at one point to claw away at the CCSU lead. The Colonials would eventually tie the game with just over two minutes to go in the half, and later take a four point lead in the second half before the Blue Devils went back to work. Junior Jamir Coleman gave CCSU the lead back with a 3-pointer midway through the second half, and Krishnan followed with a 3-pointer of his own to make it 57-52 Blue Devils. Robert Morris again battled back to tie the game, but CCSU had an answer in the form of the 8-0 run that put the game away. Thanks to clutch shooting at the free throw line, the Blue Devils kept a lead of at least five for the remainder of the game, while the defense stepped up to force the Colonials to miss 24 of their 31 3-point attempts on the night, thwarting any chance of a comeback. Posted in Newington Town Crier, CCSU on Saturday, 9 February 2019 21:41. Updated: Saturday, 9 February 2019 21:43.